Love in the Next 10 Seconds guides you step by step on how to have the kind of relationship you’ve always known was possible yet haven’t known how to have… until now. Are You Ready to Create the Relationship You Really Desire? Love in the Next 10 Seconds is a radical new way of approaching love and relationships. Many relationship books take a ‘one-size-fits-all’ approach giving you answers about how to ‘do’ relationship. This book breaks away from the old paradigm of relationship counseling where someone tells you what you should do in order to be happy. Instead, it guides you on how to have the kind of relationship you’ve always known was possible yet haven’t known how to create... up until now. With practical tools that you can apply moment to moment, this ebook is the shift that we’ve all been waiting for to create a new paradigm of relationship. Nirmada Kaufman is a #1 Best Selling author, pragmatic futurist and an Access Consciousness® Facilitator. She is best known for empowering and facilitating the seekers around the world who are demanding change and are ready for it now. With a radically effective and pragmatic approach she guides seekers in creating the life and future they really desire. 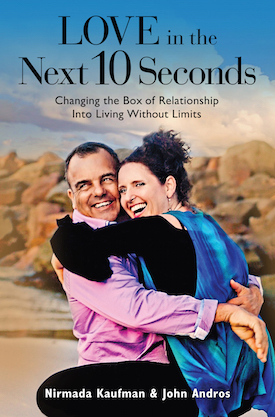 Nirmada co-authored the book, Love in the Next 10 Seconds, Changing the Box of Relationship into Living Without Limits. John Andros is a gifted and talented facilitator. He is a #1 best selling author and an Access Consciousness® Certified Facilitator. Being an unrelenting seeker he has studied with a variety of masters and learned many modalities and techniques to promote healing, self-growth and change on all levels. He has a kind yet potent presence and empowers people to know what they know and to choose what works for them. John co-authored the book, Love in the Next 10 Seconds, Changing the Box of Relationship into Living Without Limits.